It's not like it's difficult to find decent vegetarian pizza in the West Midlands but stumbling across pizza with vegetarian and vegan "meat" substitutes can deliver a whole other level of startling joy, especially in what looks like just another run-of-the-mill fast food establishment. Veggie Lounge is on Dudley Road, a fifteen minute walk, or three minute drive, from the centre of Wolverhampton, sandwiched between another unremarkable looking take-away, and a newsagents. There's some on-street parking outside, and seating for up to about ten people inside. It's in a pretty run down residential area but don't let this fool you into thinking it isn't worth a visit because, if you're a junk-food-starved veggie, the menu will have you more excited than a cockerspaniel whose owner left the gate open. Not only does this entirely vegetarian restaurant serve - with a friendly and welcoming smile - VEGAN 'pepperoni' feast, 'chicken' supreme and Hawaiian ('ham', mushroom & pineapple) as well as a whole list of other pizza, but they have a selection of vegetarian burgers with optional vegan cheese, salads, wraps, sides such as curly fries, and vegan 'fish' & chips! Vegan sausage, and vegan Hawaiian pizza - amazing & delicious! They've more recently added cakes and muffins, although none of these are presently vegan. Plus cans of drink - I had a cream soda - at reasonable prices; mine was 50p. 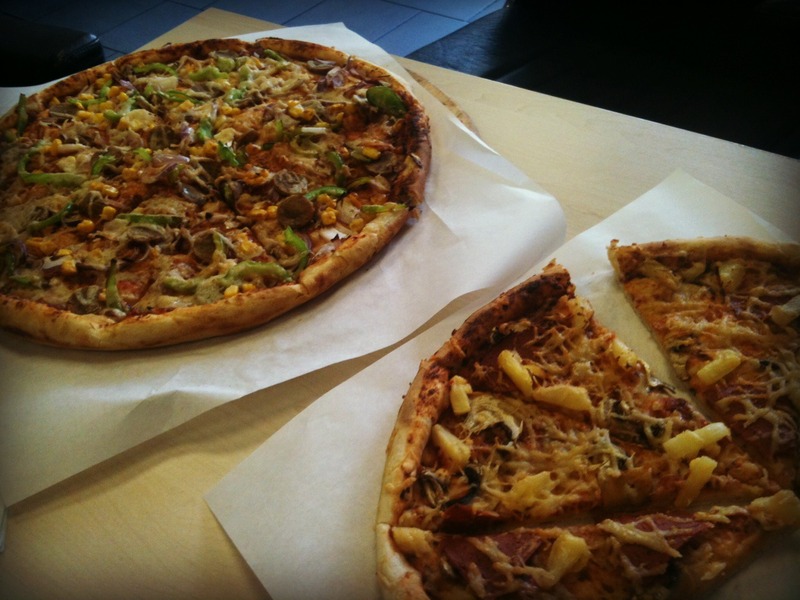 Pizzas start at around £5.99 and they have three sizes, plus special offers at certain times of day / days of the week. Why? Because you're a junk-food-starved veggie!